I was invited to contribute here by jhwygirl on transportation, land use issues, and such. Since that has gone so swimmingly for me so far (my own mistake in making in-the-moment, emotional comments that didn’t sit well with many people). So now I’ll change gears and throw my hat into the healthcare debate by sharing a friend’s story. This friend was laid off just about a year ago, a few years before she would have received a full retirement package that included healthcare. Upon termination she moved to Missoula and has been on COBRA health insurance, which will run out in a couple of months. COBRA has been pretty good to her as she’s made extensive use of it to cover abdominal surgery (which went horribly wrong) and the numerous subsequent surgeries that were needed to fix the complications from the first surgery. This has been a nine month saga costing hundreds of thousands of dollars and she is just now getting back to normal… though still weak from all the surgeries. So what will she do? Game the system by going back to college and signing up for the university provided insurance. Its pretty sad that she feels this is her only option to get affordable health insurance. According to her this is a fairly popular strategy for seniors that have lost their employer based health insurance but don’t yet qualify for medicare. With all her health problems she can’t afford to be without insurance. Not only is this not an effective way to provide health insurance, but I also wonder of how much this costs the state of Montana? If this is a truly popular option among Montana seniors as a stop-gap option to health insurance, how much money is going to cover their health problems that should be going into investments in education? This just goes to illustrating that we don’t have a healthcare system in this country, but a patchwork of less than optimal options that increasingly don’t work for the American people. This comes to us via Michael Shay at hummingbirdminds. The resolution failed on its first reading. The make-up of the Wyoming senate? 30 members, 23 of ’em Republicans, 7 Democrats. Quite the message. Let’s see if Washington, Republicans, Blue Dogs, the media and the rest of America takes note. Wherein Big Swede’s head begins to spin…. Update: The Wyoming senate actually killed two anti-health reform bills. The other was a bill that would have required the AG to investigate the constitutionality of any health reform bill passed in congress. Ok. Now that I’ve stirred the pot here by posting Baucus’ video, let me post up the transcript of his words and video, from CSPAN, and let them speak for themselves. Read his words, not in the context of how he sounded saying them (which is what the conservablogs are doing), but in the context of when, where, and in what role did they occur. Max Baucus is the chairman of the Senate Finance committee, arguably the most important position to advancing a health care reform bill. We have debated Baucus’ role on this committee endlessly, here and on other blogs. While my opinion on Baucus’ efforts are well known, it appears that his tirade, as filmed by CSPAN, and rebroadcast by YouTube are casting him in another light. I thought early on that Baucus was naive to think he could garner any bipartisan support, and that his strategy of positioning his legislation such that it could gain bipartisan support would eventually implode. Which it seems to have done, as it has ignited a firestorm between progressive, left and liberal factions in the health reform debate, and castigation from the right. So when Max goes on the floor two days before the final vote, and unloads, he does himself and his legislative fforts a great disservice, as he hands his opposition the tools to derail his efforts to shepherd his bill through conference. It was a serious tactical breach in what to this point had been a carefully thought out, though misguided, strategy of bipartisanship. I’d offer up that the chairman of the Finance committee melting down right before the final vote on his bill to be not his finest hour, when in essence it should have been. If I were of the “kill the bill” mentality–which I am not, though I think the mandate needs to be struck from the bill, and much backfilling needs to be done–then I would celebrate this outburst as being Baucus’ “macaca” moment. While history will look at Baucus and his role in health reform, I don’t think that moments like this reflect positively on his legacy, given that they are a reaction to his own failed strategy of bipartisanship. Full transcript of Baucus’ words below the fold. Following up on Monday’s news that ABC/Time polling showed 57% support a public option in health insurance reform changes being hammered out in congress, today brings us news that affirms that trend. CNN polling tells us 61% favor a public option for inclusion in any health insurance reform bill. That number is up 5% since late August. A few short weeks ago – just before the Senate Finance Committee’s bill was freed – Speaker of the House Nancy Pelosi ordered a CBO markup of the cost of including a public option. She wanted an analysis of 3 different versions. Guess what? The CBO found that including a Medicare-for-all option, along with a 5% increase in doctor payments, would actually lower the deficit. The cost? $871 billion over 10 years – and it would insure everyone. The Senate Finance Committee’s bill leaves 25,000,000 American uninsured. House Democratic leaders wisely quick to jump on this – and even Harry up there in the Senate is is hinting that he’s got the 60 votes necessary to pass a bill that includes a public option. Keep the calls and email folks. I’m told I put up Tester’s fax number for the Missoula office last time – and Pete was kind enough to fix it…this time, I’m a cuttin’ and pastin’ out of that post, that way I know the numbers are correct. With apologies to all…. Sen. Jon Tester – 728-3003 here in Missoula – 1-866-554-4403 statewide. Rep. Denny Rehberg – 543-0663 here in Missoula, or 1-888-232-2626 statewide. An ABC News-Washington Post poll released today shows that 57% of Americans support a public option. Limit it to only those that can’t afford market insurance? Support soars to 76%. And what if the GOP refuses to participate? Still a majority of Americans want reform. What should those concerned about electing and re-electing either Democrats or Republicans think of those numbers? Well, howz about these numbers for those watching the election factor of health insurance reform. Every so often, our daily newspaper gives us competing versions of an important story. Today was such a day. There’s this guest column and this news interview. Both are on the subject of health care. The guest column was penned by Greg Roberts, a former health care executive. The interview of President Obama’s Deputy Chief of Staff, Jim Messina, was conducted by Charles Johnson. Guess which person was advocating a single-payer system, or at the very least, a strong public option? Hint: it isn’t the guy who used to be Sen. Baucus’ Chief of Staff before moving up the ladder. Sen. Max Baucus, representative government is a cornerstone of our democracy. We elect individuals to serve society’s best interests. Yet “government of, by and for the people” seems a concept as foreign to you as you to it. For 12 months, our Senate Finance Committee has engaged in what has amounted to a charade on this matter. From the start, advocates for true reform were excluded from your hearings, a prologue to what followed. Asked about the lack of a public option in the Baucus bill, Messina said it has one in the form of co-ops. I’ve got to go with Roberts over Messina on this, ” … a very good bill that can bring people together … ” Yeah, right. People are lining up to sing the praises of the Baucus bill. As to the lack of a public option, ” … it has one in the form of co-ops.” A co-op is not a public option and even the CBO is skeptical. (The co-ops) didn’t impress CBO. “The proposed co-ops had very little effect on the estimates of total enrollment in the exchanges or federal costs because, as they are described in the specifications, they seem unlikely to establish a significant market presence in many areas of the country or to noticeably affect federal subsidy payments,” the analysis said. Translated out of wonk-speak, that’s pretty harsh; it basically says they won’t work. Then there’s ” … he’s spent a whole bunch of time doing his homework and is working hard to produce the best bill that he can produce.” If that’s the best bill he can produce, maybe somebody else should take a crack at it. There has never been a better argument for the public plan than the one the insurance company just handed the Democrats in congress. They have produced a shoddy, self-serving report as a blatant threat to raise premiums higher than they already plan to raise them. If there has ever been a more obvious case of bad faith than this, I haven’t seen it. The only thing that will keep these corporate criminals in line is either price controls or stiff competition and if they can’t keep their companies solvent without giving their executives outrageous pay packages, charging ridiculous prices while denying care to sick people, then maybe their financial model just doesn’t work. The health insurance industry contributes upwards of 25 percent to the annual cost of U.S. health care and medical value. Viewed in the light of other nations who provide (based on factual data) higher quality, less expensive, universal coverage to their citizens, it is not difficult to understand the economics of the matter. 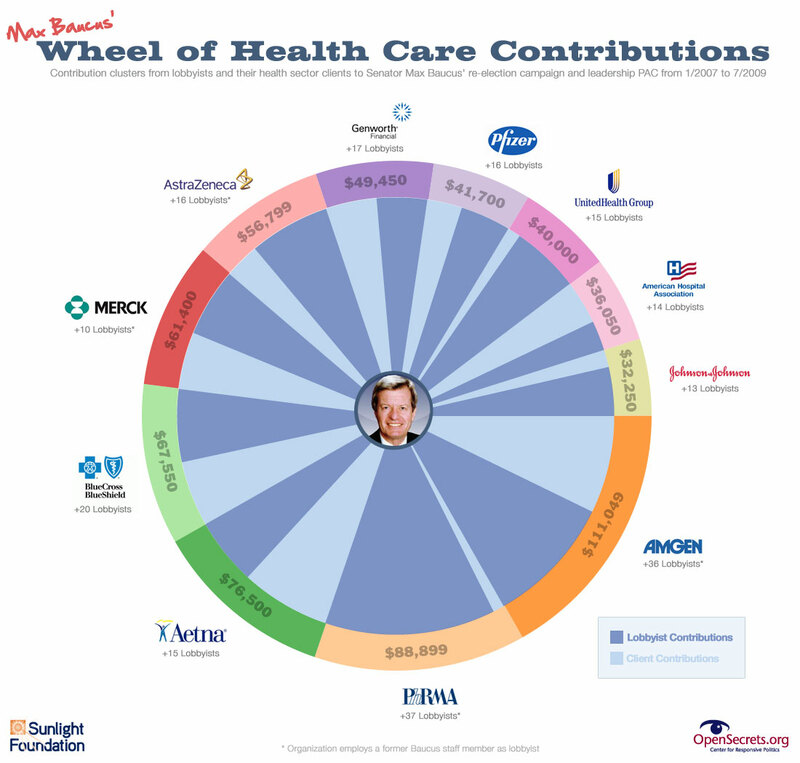 In you (Baucus), Chuck Grassley and others, the U.S. health insurance industry has the best representation money can buy – and our society has a government of, by and for corporate interest. What I know about Messina is this: he’s extremely loyal. One would assume he’s working in the President’s best interests, not his old boss’. But right now, to be honest, I’d prefer that Greg Roberts, not Jim Messina, has the President’s ear. …because “he’s funny as hell and the bomb.com,” according to his Wikipedia page. Getting to the point…Jim Messina, Deputy Chief of Staff for President Obama is in town to enjoy this weekends festivities, I’m sure. Jim Messina who used to live here in Missoula. Jim Messina who graduated University of Montana. He will be out and about, and you just might run into him. See what a great nice looking guy he looks like. Very approachable…extremely pleasant. Look – I don’t want anyone to miss the possibility of, say, passing a note to Mr. Messina and telling him that you support a public option and a single payer system. You can add some of the other stuff that’s been written around here too, but really, you can keep it short and sweet and I’m sure he’d probably appreciate a certain economy to your words. I do believe he deserves some time off from the pressures of D.C., and in that respect, I’ll personally pledge to ignore his next two stops here after health insurance reform is passed. But for now? Pass him a note if you get the chance. Now just where is that Republican health care plan that Cantor and Boehner promised the country months ago? Anybody want to defend republican support for the status quo here? And for those that think republicans have a plan for health care reform, why didn’t they git ‘er done during their time in control of Congress and the Bush White House? And all of you with out-dated conservative ideas and/or tea bagger noise with no political base to work from, you’re just pissin’ in the wind here. I’ll keep this short and let the others who are better versed in health care reform than I to weigh in — both here and at other sites. Sen. Baucus voted against a public option plan, similar to Medicare, that was proposed by Sen. Jay Rockefeller. Baucus said he voted against it because he’s looking for a plan that would get all 60 Democratic votes in the Senate. I know Max is savvy enough to count votes. So, which Democrats are against the public option? Please, tell us Max. That way we can work our asses of to keep them from getting re-elected — just as I’ve committed myself to searching for a candidate to run against you in the 2014 primary election.